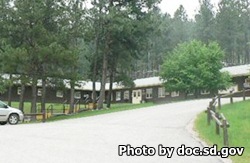 QUEST is a juvenile corrections program for female offenders located in Custer South Dakota. Offenders here are housed in an open dormitory that holds up to 32 female offenders aged 14 to 17. Offenders are provided their own bed, personal storage area, closet and changing room. The facility houses mostly non-violent offenders. Juveniles at this facility who fail to follow the rules will be discharged to a correctional center with more restrictions and higher security levels. During intake all offenders are assessed and a course of treatment is decided. Juveniles can receive individual and group counseling, substance and sexual abuse counseling, and various mental health services. In addition, medical and dental treatment is provided to all offenders. All juveniles at this facility will receive educational classes and can earn a GED during their term at QUEST. Religious worship services are held once per week, attendance is voluntary. The visiting hours for offenders in the QUEST program are currently unavailable. If you know the visiting hours please leave a comment below, contact the facility at the telephone number provided for more information.